Tuscobia Trails—the 74-mile stretch of lonesome woods from Park Rapids, Wis., to its counter-weight at Rice Lake—would just as soon sit you down, send you home, beat you into submission. 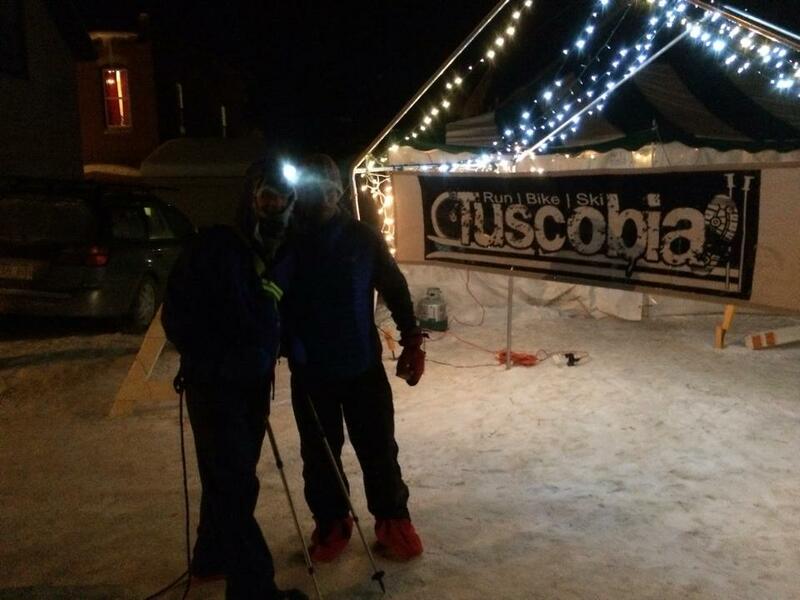 Meanwhile, Tuscobia Race Directors, Helen and Chris Scotch, wish racers to a finish; volunteers are on the same side, too. 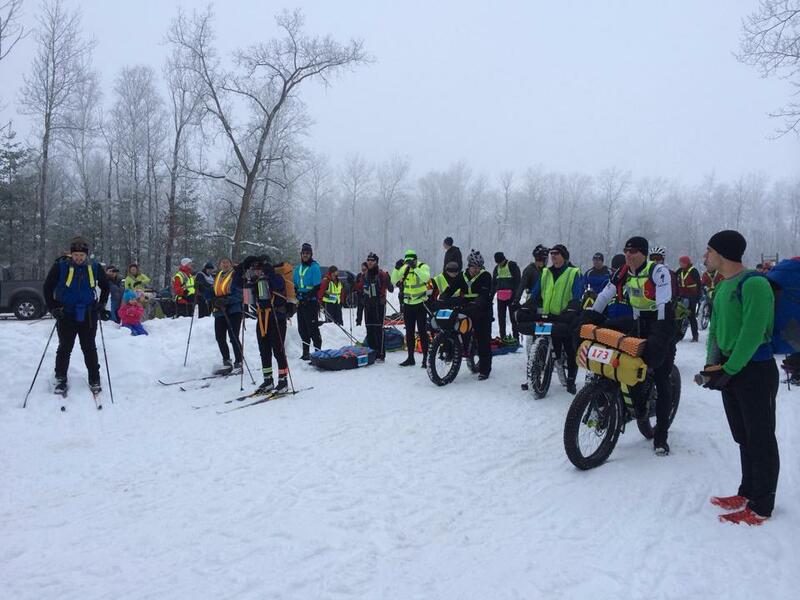 Competitors in the three distances of 35, 75 and 150 miles of running, skiing and snowbikes press for finishes, ignoring pain, weather, discomfort and about 1,000 other distractions to reach the lit white canopy yelling “You finished!” in the CCC alleyway. Buffington, a member of the “Death before Dishonor” bike group, raced the Trans-Iowa in 2011, a 300-mile bike race on Iowa’s back roads. He biked the Alaskan Iditarod in 2013. Sawtooth, now known as the Superior 100, saw him complete the dastardly distance in 30 hours. 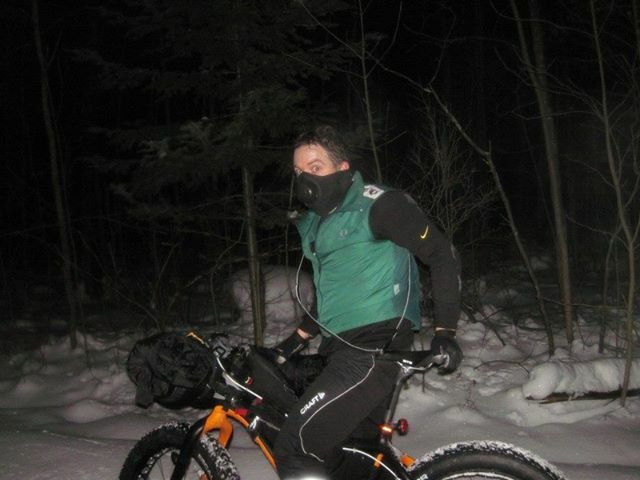 And, yes, he has Arrowhead 135 finishes, like 2013’s 16:16 on his snowbike. He zoomed to a course record, 37:16, in 2012’s run. 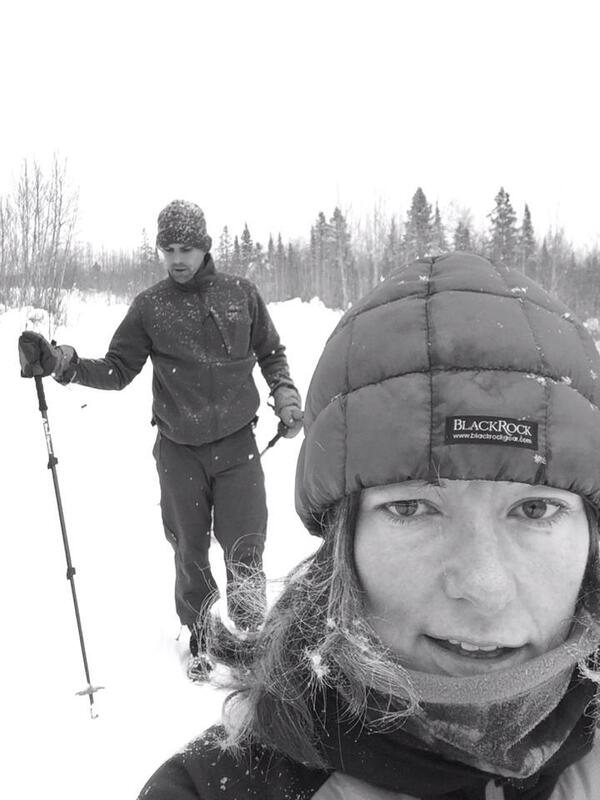 “I’ll probably foot Arrowhead if my feet and legs recover.” He then heads to Alaska for another Iditarod, earning a nice award from Tuscobia helping the trip. The battle for men’s silver resulted in another entry for the adage “never give up.” The race came down to Wilderness Athlete’s Gnarly Bandit Ultra Series two-time winner, John Taylor, and the 300-Mile Man, Roberto Marron. By the time these two checked in at Winter, 30 miles remaining inbound, the remaining field of 13 had dropped along the way, doomed to wait another year before the opportunity to redeem Tuscobia’s finish arrives. Throughout Saturday’s dusk and night, Taylor led Marron by 46 minutes. 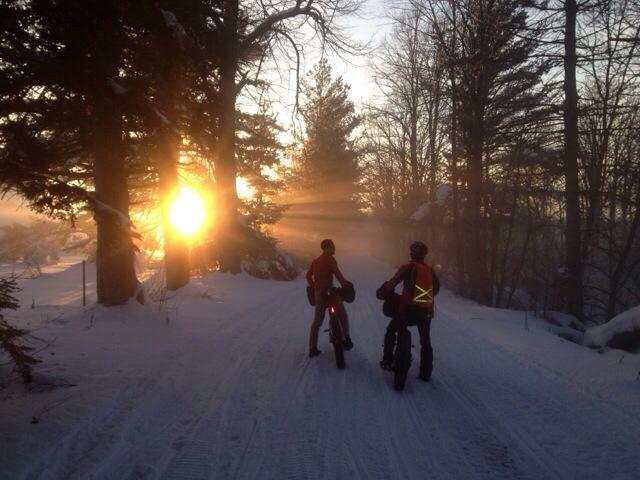 Hitting the trails at Winter’s checkpoint at 7:28 Sunday morning, Marron had made no progress overnight in catching him as the time separating the two actually had ticked up to 48 minutes. Racers faced bright sun on Saturday afternoon, “blinding” was how Marron described it, partnering with warm temperatures. Then a Tuscobia surprise as a nasty front swirled through, chilling the night as temperatures dove in the deep freeze, the wind gates opening, too. Two pre-race favorites, 2012 winner John Storkamp and Chris Scotch, the only competitor other than Marron to have finished each 150-mile race on foot since its inception, developed issues and shockingly retired from the race. Marron, now a Wilderness Athlete athlete, stepped up his pace after Pine Creek. 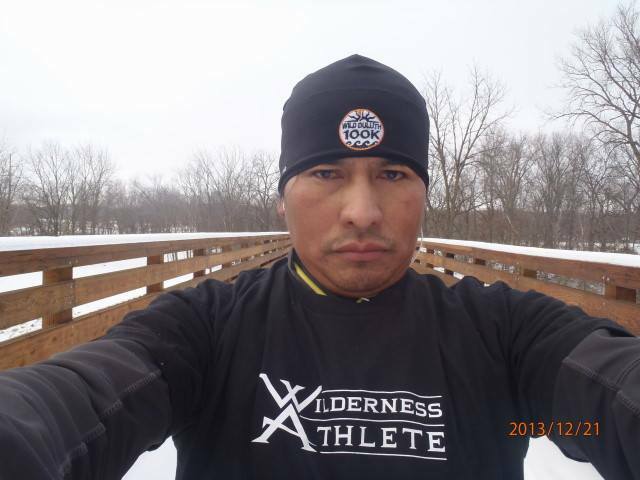 He downed an extra bag of chips left for the racers at this 35-mile race pit stop that shortly afterward required him to visit the woods—I mean, deeper in the woods—after which he felt like running. “I was worried; it cost me time. But, my pace picked up to about 7-minute miles (with about nine miles to go). I had no idea how fast (Taylor) was going, but I could see his tracks. Finally, I saw someone up ahead but (the racer) had poles, who is it since I hadn’t seen him with poles. I pulled up alongside, noticed it was John and he said, ‘Hi, Roberto.’ I invited him to run with me going in so we could make sure we make the cutoff.” Taylor was comfortable with his pace so Marron stayed at it to finish in 59:35 for the silver. Taylor nailed a 59:58, winning bronze, with two big minutes to spare, 120 seconds over 150 miles cushion. Marron’s effort demonstrates the race isn’t over until the finish-line sings. 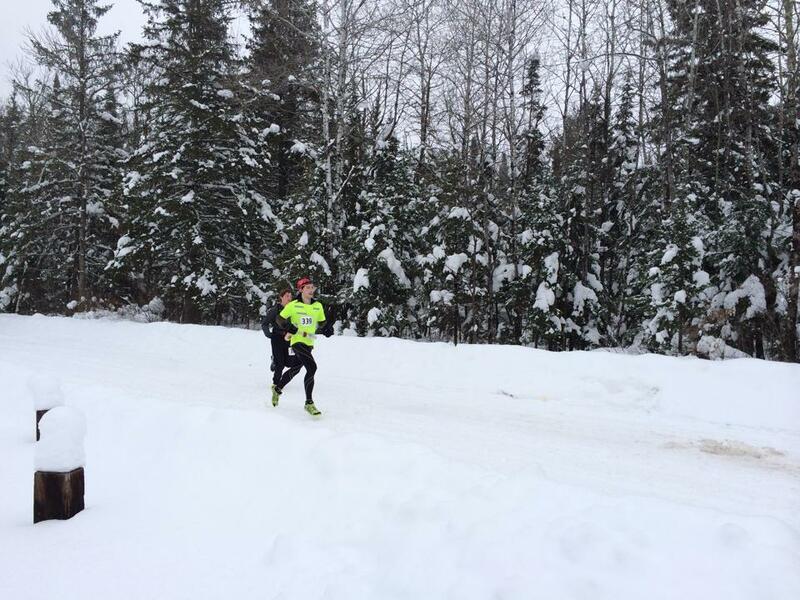 Taylor again affirms how I describe him in The 300-Mile Man: Roberto Marron Doubles Tuscobia’s Winter Ultra . . . the man who never gives in. 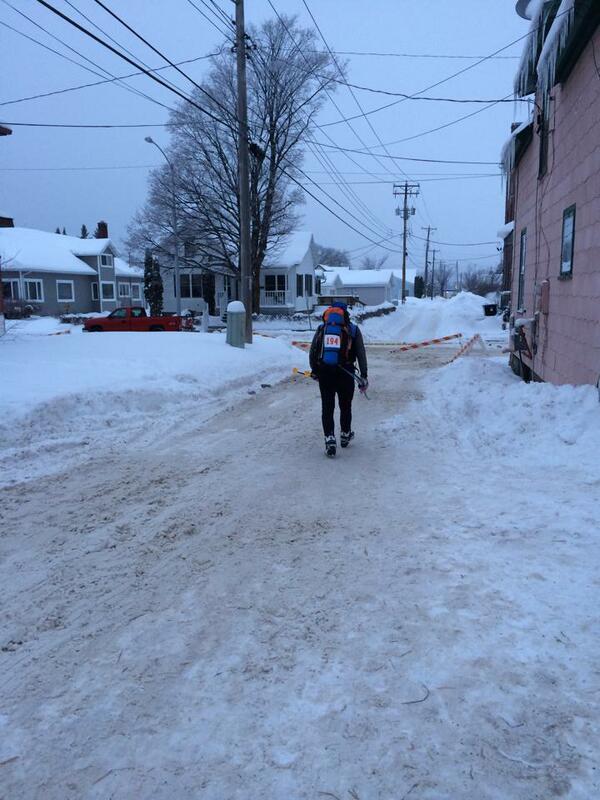 Mark Scotch, the lone 150-mile ski entrant, crossed in 37:34, the first to break finishing tape in the event. A 2013 winner of the coveted Order of the Hrimthurs, Scotch at age 58 sets an example for all sedentary males on their couch during Sunday football games. A deep group of bike entrants for the 150 saw Charly Tri complete the out-and-back in a strong 20:26, just about six hours ahead of Dan Lockery’s silver. Tri earlier nailed a 17:23 in the 2013 Arrowhead, one of its toughest years, good enough for a seventh place. Mark Seaburg claimed bronze with his 26:48 finish. Only Chris Plesko finished afterward in 29:53 as the class mirrored the low finish rate for the foot racers. Neither strong women athletes, Lynn Saari, or 2012’s winner Svetlana Kovalchuk, completed the distance for the 150 bike class. The field of Frost Giants, possible 2014 Order of the Hrimthurs winners, is now set: Scotch, Buffington, Lucas, Taylor, Marron, Tri, Lockery, Seaburg, and Plesko as to win it, one must finish a Tuscobia 150 distance, attack and complete Arrowhead’s 135, then capture Canada’s Actif Epica. 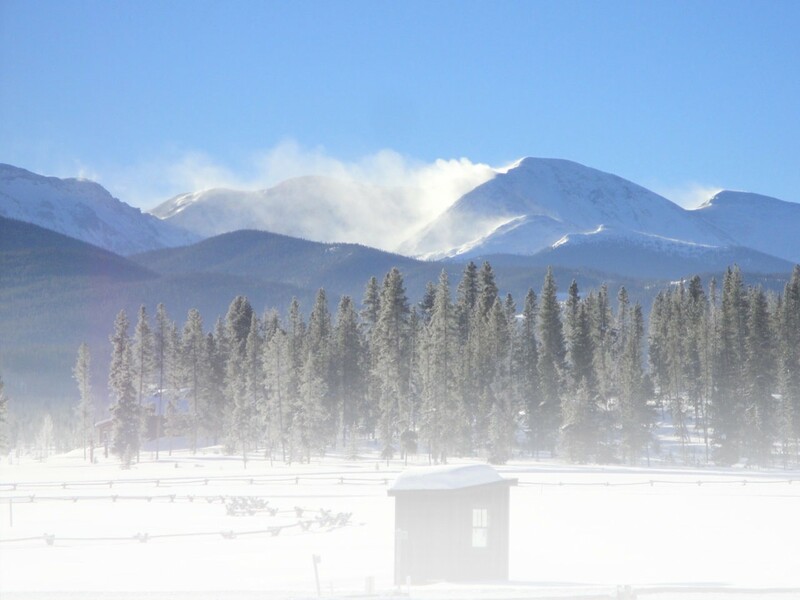 A coveted honor, the Order is extremely hard to earn though the popularity of distance winter events will increase those who will try to capture its essence while instead learning the lessons supplied by the Hrimthurs. Oh, there are bigger, well-known honors in sport but at times the best of them are those that challenge on an individual basis to overcome, survive, challenge, and strive to finish when all of one’s faculties are screaming “Quit, quit, quit you fool! Comfort can be found only when you quit!” Instead, the driven competitor casts aside those dispersions while allowing only images of completion push them to a finish. That form of “quitting” when passing the finish line is a happy one, earned and respected to one’s core. Those are the athletes who deserve the Order of the Hrimthurs, one of the most important of sport honors. New course records also were set in the 75-mile ski event as 65-year-old Lindsay Gauld won the men’s class in 16:06 and Lisa Paulos, nicely over 40, surprised with an exact 29-hour flat finish for the women’s category. Oh, say you, sedentary souls: look at these two. Brandon Purdue won the 75-mile distance footrace in record time of 15:46. Silver went to Peter Ford with his 20:38 finish, Nathan Jackson bidding bronze in 22:16. First place for the women’s class for the 75-mile run recorded a tie as Bonnie Busch and Laurie Tulchin both earned the win in 29:00, the only women in the distance. Lucky Larry Sandhaas finished with these two gold medalists. The bike win for the 75-mile class, recorded by Greg Gleason in 8:59, came while Steven Yore crossed just four silver minutes later. Marcus Steele hammered the bronze finish with his 9:36. In the women’s class, Duluth’s Leah Gruhn stepped up with a finish, a racer brave enough to go this distance. 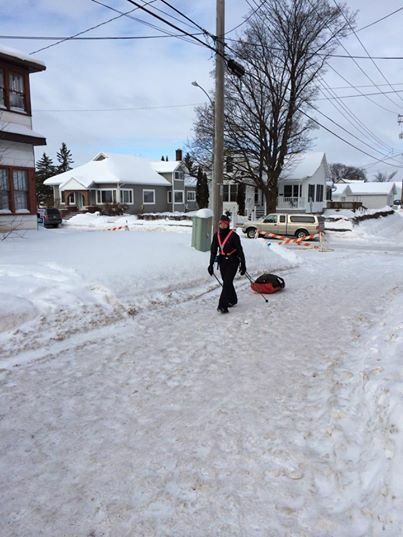 Gruhn is a true Tuscobia veteran with her first year here in 2010 on skis. She now has raced the last three years on her bike. “This year,” she told me, “the trail was rather soft for the first portion, but firmed up very well as the day wore on . . . the cold and wind was welcomed with open arms. It is uplifting to run into old friends here and make new ones once again this year. This race is always a favorite for me since the race directors and volunteers do such a great job.” Now she’s headed to Arrowhead . . . . However, the 35-mile women’s bike race saw ultra athlete Leslie Semler take her first win on a bike in 4:27. “Just the kids race at Tuscobia, but I’ll take it,” she quipped. Andrea Coyhen came in 15 minutes later for the silver while Ms. Sioux Falls, Tina-Joe Stiller captured bronze at 4:54. Next up for her? Arrowhead. Justin Piontek headed the men’s 35-mile class with a 3:30 gold finish on his snowbike while Eric Stanke won silver four minutes later. At a 4:16 ET, George Kapitz secured the bronze, just one minute ahead of Shane Veldhuizen. Kristin Palecek achieved notoriety when she became the only finisher in either class consisting of three entrants. Her time recorded a strong 7:07. Well-known ultra runner, Wynn Davis, handily seized the 35-mile run in 5:20. Gregory Danowski grabbed silver in 6:08 while bronze charmed Jason Penticoff’s 6:32. Legendary Bob Rusch, Tuscobia’s most senior entrant, raced to a 10:44 finish. For the women’s 35-mile foot race, Faye Lopez broke eight hours with her 7:57. Linda Britz stashed silver in 8:20 while six minutes later Dawn Long hooked the final spot on the podium. Tuscobia lives its reputation starting at the CCC, the Chequamegon Canoe Club bistro, as the event’s headquarters in Park Falls. Out the alley, under the race’s canopy with dangling holiday white lights glowing, hearty souls head to the trailhead for a wondrous adventure. For many, the journey is shorter than planned; but none can say it wasn’t an adventure. 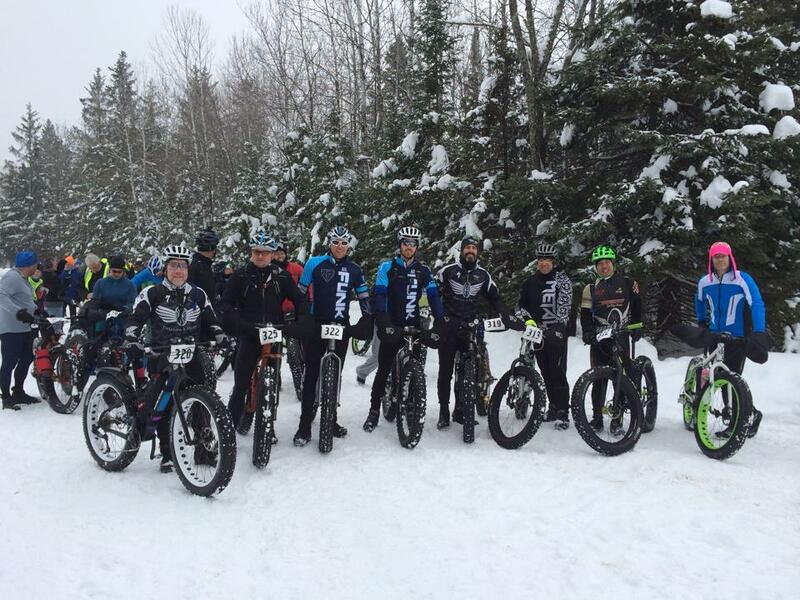 This entry was posted in Features, Homepage Featured, Snowshoe Racing and tagged Actif Epica, Arrowhead, Braveheart snowshoe series, CCC, endurance, Gnarly Bandit, Hrimthurs, Park Falls, pulk, Tuscobia, Wilderness Athlete, Wisconsin by Phillip Gary Smith. Bookmark the permalink.